You are here: Home / Natural Fine Planetary Talismans / Celestial 3 gemstone trinity pendant/ Triratna Jyotish Talisman-Potent and powerful! 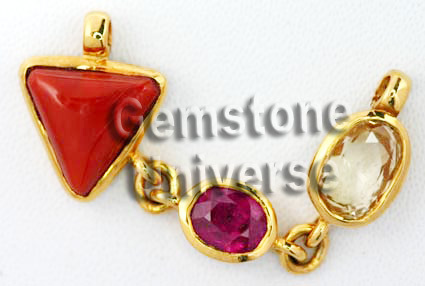 Ruby, Red Coral & Yellow Sapphire in a single pendant! Celestial 3 gemstone trinity pendant/ Triratna Jyotish Talisman-Potent and powerful! Ruby, Red Coral & Yellow Sapphire in a single pendant! This is a three gemstone trinity pendant and is very useful for individuals who have been recommended a 3 gemstone combination. The combination and placement of the gemstones is very specific and the gemstone should touch the thymus gland area (just above the first rib bone) for optimum benefits. This is a great option for those who would prefer a pendant for gemstone therapy than a ring. This pendant consists of a Natural and unheated Burma ruby of 1.71 carats, a Sri Lankan Yellow Sapphire of 2.96 carats and a triangular Organic Sicilian Red Coral of 4.22 carats. The ruby stands for Sun and represents focus, concentration and self esteem. The Yellow Sapphire stands for Jupiter which represents honesty, truth, good luck and academic excellence and the Red Coral stands for Mars which represents energy, enthusiasm, courage and drive. All these gemstones are of planets that are intimate friends and will deliver superior results.